SERVPRO of Baltimore's Inner Harbor knows that knowledge is power. 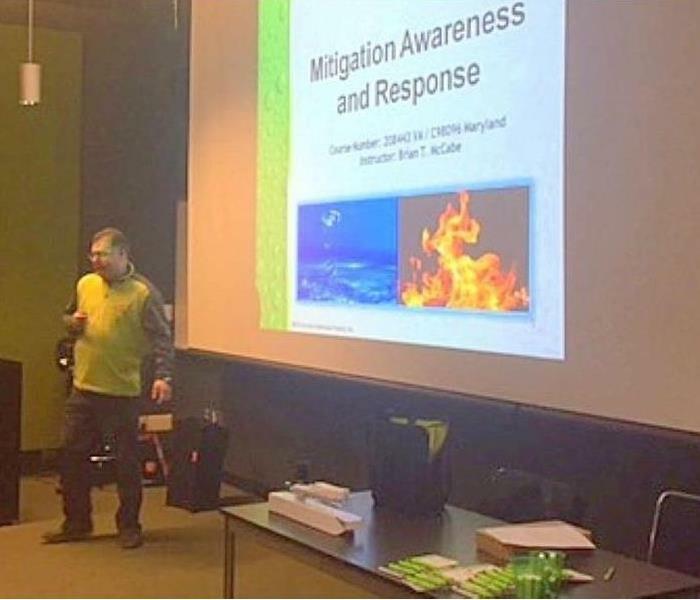 SERVPRO wants to help people in the community know the correct way to handle mitigation on their property as well as knowing when an expert is needed. SERVPRO of Baltimore's Inner Harbor is always giving free classes to local businesses to let their staff know the right way to handle clean ups. This could be anything from water to biohazard clean up. We want them to have the power to make the right decisions and to be above all be safe. SERVPRO of Baltimore's Inner Harbor trucks are always ready. SERVPRO of Baltimore's Inner Harbor knows it's important to get to your emergency fast and ready to go. There is nothing worse than having to go back for equipment before mitigation can start. SERVPRO stocks all of our trucks and van with the best equipment and plenty of it. When we arrive we are ready to roll. SERVPRO of Baltimore's Inner Harbor uses all the latest equipmenet. SERVPRO of Baltimore's Inner Harbor has the latest water detection equipment. We can find the moisture before the demo. This homeowner had a roof repair 3 weeks prior and saw a spot. SERVPRO came out , did some readings ,and found moisture and mold. We knew exactly where to demo and make things right. Do you have plans in place for an emergency with your business.? Did you know that half of businesses don't recover from a disaster? 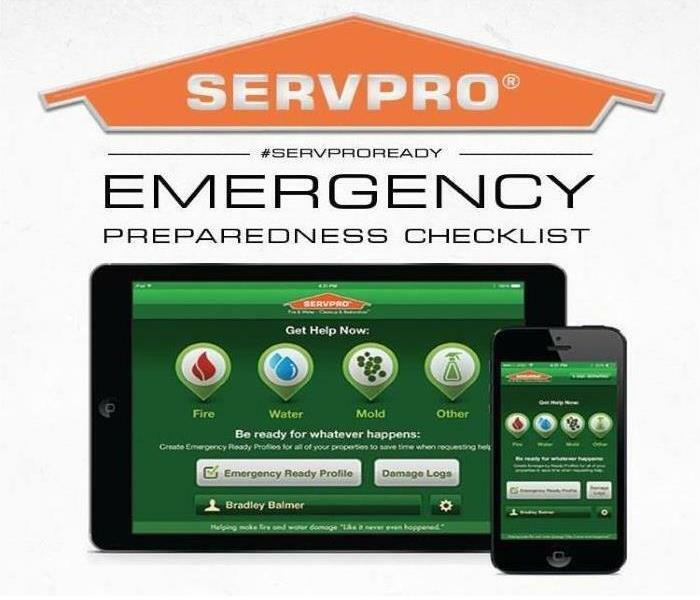 SERVPRO of Baltimore's Inner Harbor wants to help our clients be ready for a disaster with an Emergency Ready Profile. We do this at no cost and enjoy working with businesses to make them more aware of what to do when an emergency strikes. SERVPRO of Baltimore's Inner Harbor cares about your family lke we do our own. You care about the safety of your pets and people in your home. SERVPRO does as well. 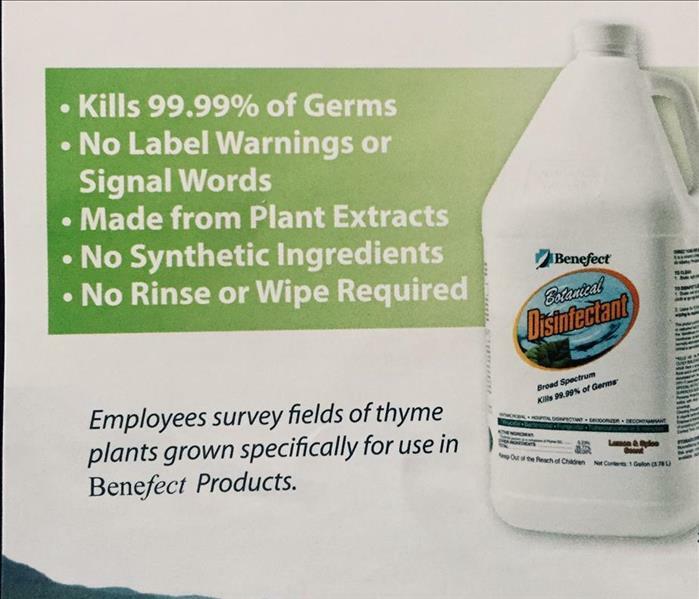 We use chemicals that are safe for the environment. We are willing and able to give you a breakdown of all chemicals we use on site . We want you to feel safe after the cleaning is done. SERVPRO of Baltimore's Inner Harbor wants to you back to normal faster. SERVPRO is always attempting to save vs demo. When we use the ducting method . The cavity of a double sheeted rocked wall could take a few more days to dry in place but it's shorter in the long run. Avoiding demo which would still need dry time and then of course repair , saves time and money. Don't assume your dryer vent is clear. Dryer fires cause property damage, injuries and even deaths every year. Clean and empty lint out of the exhaust pipe. Check closely for tears and rips in the filter. Never put any synthetic substances in the dryer. Only run a dryer when someone is home. If the dryer is gas-powered make sure it's routinely checked. Keep things away from the dryer that could catch on fire. Keep the water out of your house! We have all seen the game "What's wrong with this picture". It's kind of fun to see what doesn't belong in the picture until it's a picture of your house. 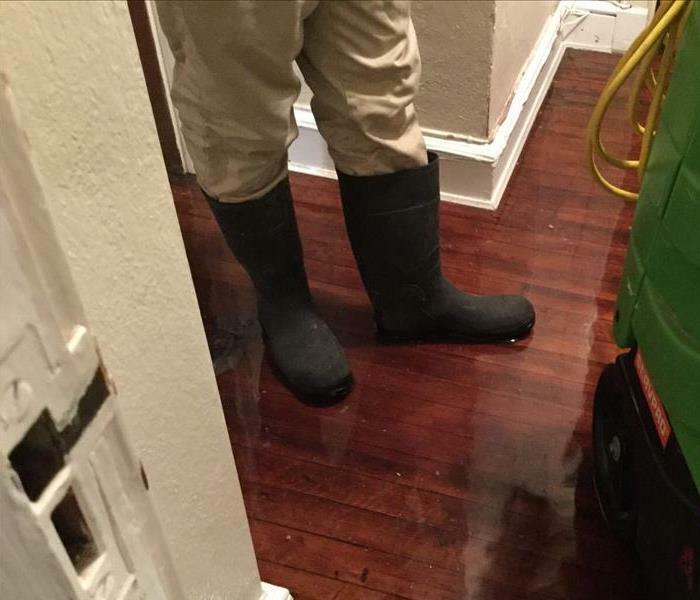 In this picture, rain boots shouldn't be needed inside the house. When rain from a storm makes it's way inside it's not a game. Make sure your prepared. Have your roof checked, chimney, sub-pump to just name a few things. Keep the rain outside where it belongs. You want to take your rain boots off before you come inside, not put them on to come inside. Don't wait until you see the mold to call. Did you know that before you see mold there can be signs that you have mold. Call the experts at SERVPRO of Baltimore's Inner Harbor to test for mold. Did you know SERVPRO specializes in Commercial Restoration as well as Residential? 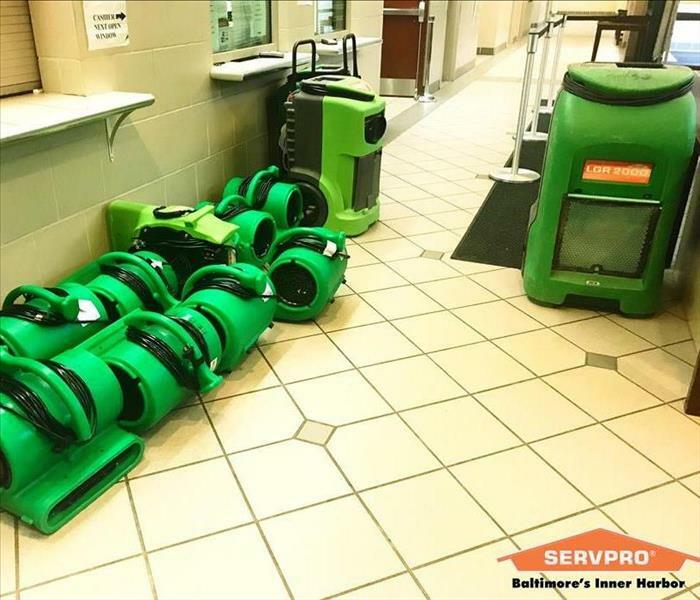 Let SERVPRO of Baltimore's Inner Harbor help your business get back in shape after a disaster. We work 24/7 to get your business back up and running. With the freezing temperatures upon us make sure you stay proactive. Open your cabinets to let heat get to pipes. 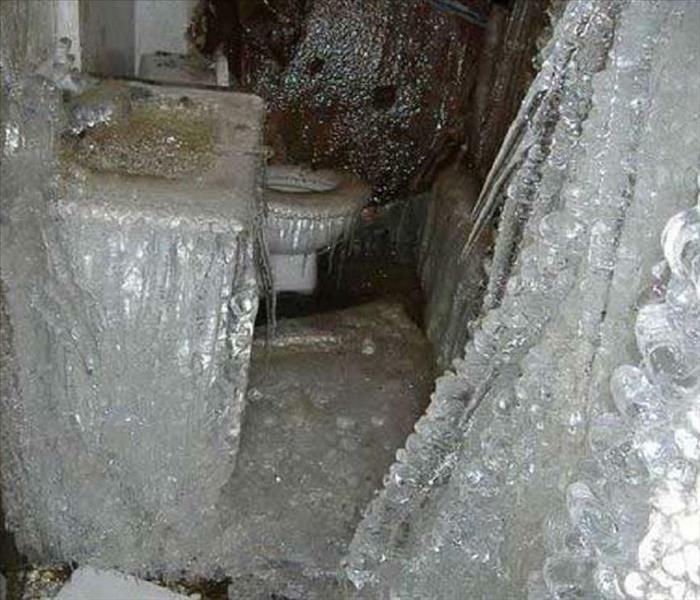 Make sure your pipes are wrapped or insulated properly. If you do have to leave town, drain your pipes. Keep the garage doors closed. Lastly, know where to turn off the water if disaster strikes. Cardboard as you might guess is no match for water. We never know when a water disaster might happen but we can always try to be prepared just in case. If possible but all things off the floor. 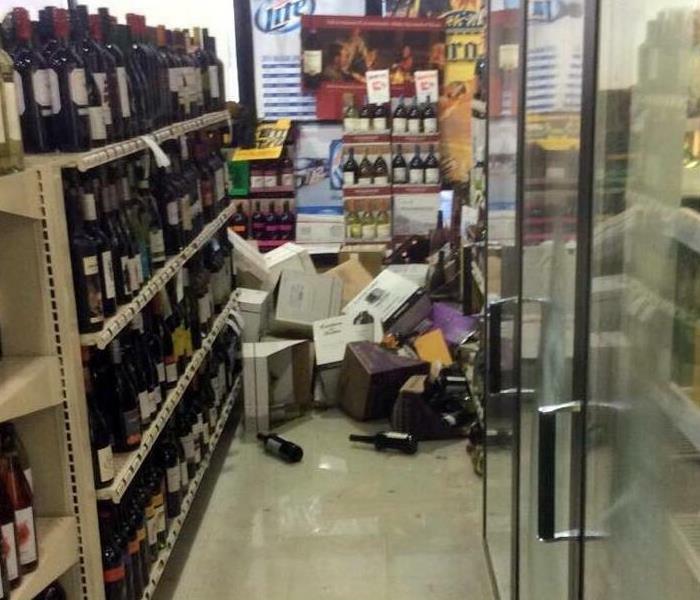 This inventory could have been saved if only it had been a few inches off the floor. Think ahead whenever possible. We can't always avoid all losses but we can help make them less severe. When we say we love being involved in the Baltimore community as much as we possibly can, we aren't kidding. We love it because we live and work here. So it's no surprise that some of our team loves catching a game at M&T. We are proud members of the Ravens flock! Baltimore is our home and that's why we love helping to take care of yours. This past week/weekend we were representing at MACoCon (Maryland Association of Counties' summer convention) in Ocean City, MD! We had a blast meeting with other locals with officials for a fun and productive event. 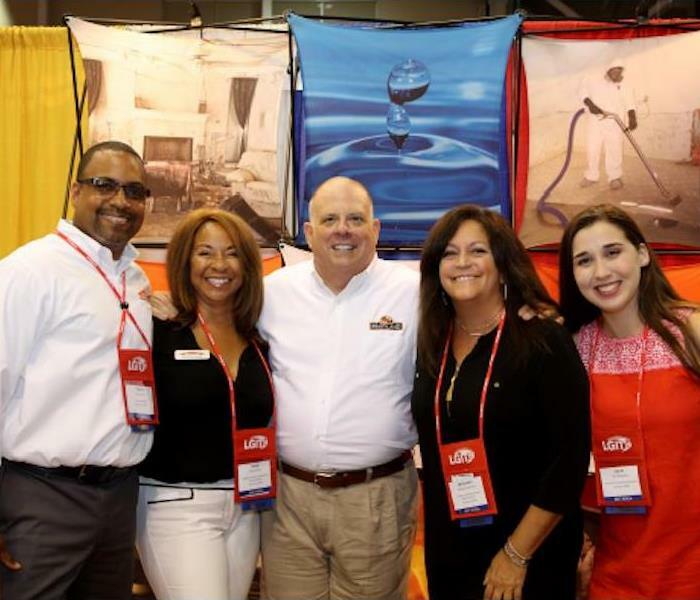 Here our rep Bethaney is (2nd from right) with Governor Hogan. Staying active in our local community is all apart of the SERVPRO mission. 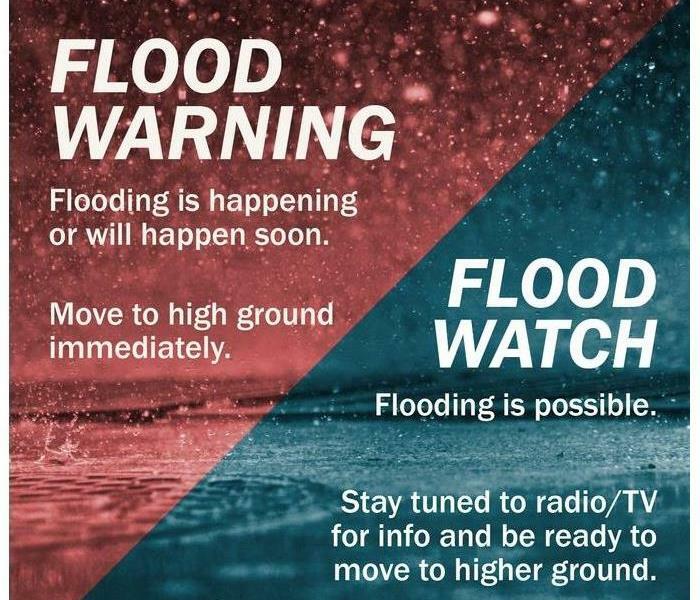 Knowing the difference between a flash flood warning and a flash flood watch can be the difference between being prepared and your Baltimore experiencing heightened damage. It's important to stay tuned to local Baltimore agencies (weather on TV stations, the radio, etc.) so you can be prepared ASAP. Also be sure to connect with your local emergency channels through social media, so you can receive alerts easily. Additionally, our SERVPRO of Baltimore's Inner Harbor team updates our social media when our area is under any important weather watches. Be sure to connect with us on Twitter and Facebook! Serving Baltimore's Inner Harbor Means Just That! Our franchise name is not to be taken lightly. We truly do serve Baltimore's Inner Harbor...as can be seen in this photo! One of our SERVPRO of Baltimore's Inner Harbor crews responded to a call for smoke damage cleaning on a boat in the Inner Harbor. We are not selective when it comes to the jobs we can take on. We know how important it is for any piece of your property to be restored, that's why our teams are specifically trained to deal with any number of affected items when damage occurs. Our teams have certainly seen our fair share of mold, so when it comes to finding it, there's no hidden spore we won't seek out. 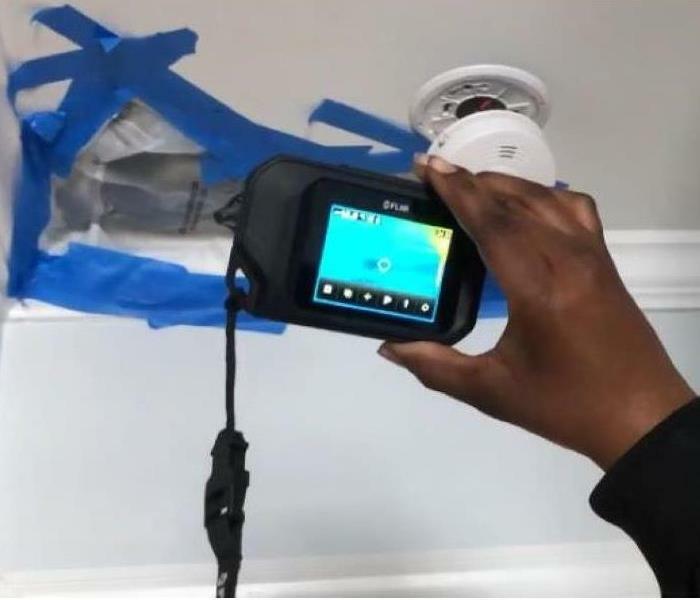 Our SERVPRO of Baltimore's Inner Harbor crews are specifically trained to utilize special equipment to find any mold, but sometimes it is as simple as getting a flashlight on the job. 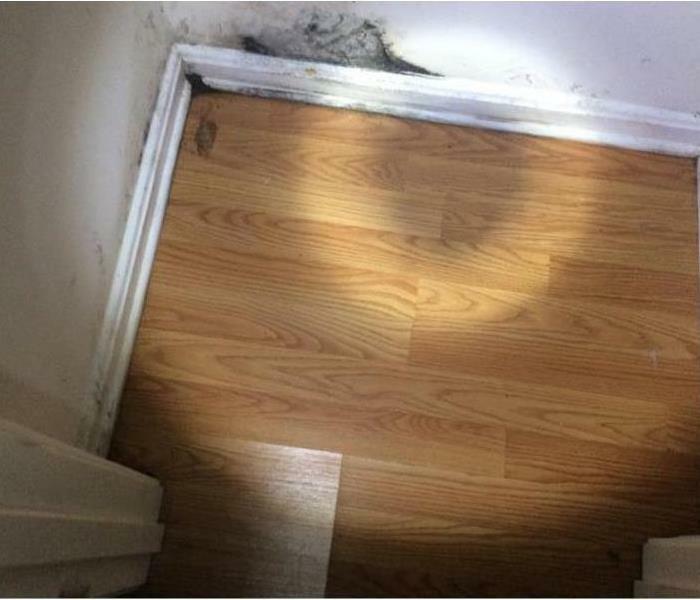 In this Baltimore home, mold was hiding in plain sight in the dark. 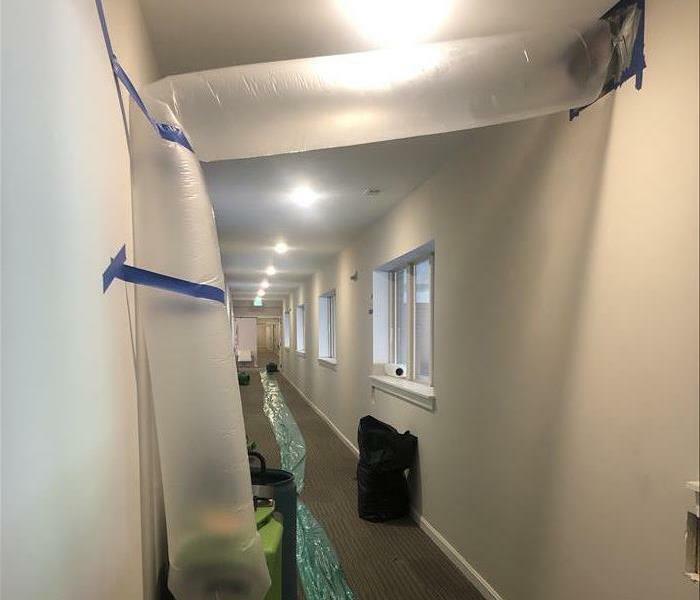 Other mold remediation companies might not work as thoroughly as our SERVPRO of Baltimore's Inner Harbor crews do to ensure that your property is completely free of mold. We inspect your home or business before, during, and after the mitigation process so as to make sure mold is completely gone. We work to make sure you're as informed and comfortable as possible because we know that any damage to your property can be incredibly stressful. Have no fear, SERVPRO is here! Mold is one of those property issues that might embarrass you to admit having. However, the longer you leave mold to its own devices, the more severe your issue can become. 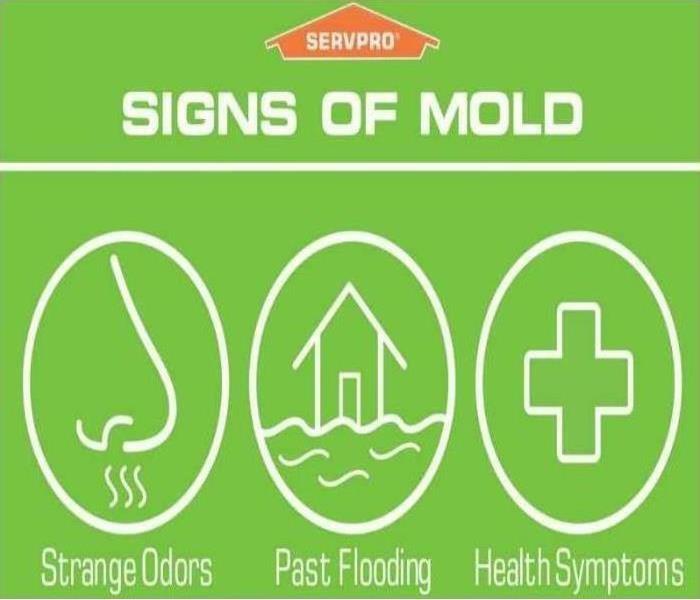 If you suspect mold in your home, it's important to call SERVPRO of Baltimore ASAP. Not only will we inspect your whole structure for mold if we suspect it is more than one place, but we will remediate the mold completely. If the mold is as severe as picture, our rebuild team can demo the necessary structures, and rebuild them like new. Mold doesn't care where it grows. If it has moisture and darkness to feed on, it will grow until it is stopped in its tracks. As you can tell, mold can make its way onto pretty much anything. In cases of homes that are uninhabited for long periods of time, air doesn't circulate as much and any unattended water damage has the prime opportunity to spread wherever it pleases. If you have a property that you aren't always at, eg a beach house, spare products facility for your business, etc., we recommend you check in on it regularly. Leaving buildings alone can mean you might come back to damage on par with this moldy fan. A house fire is a nightmare for just about everyone, but that doesn't mean it's impossible to get your home back to normal. Usually if your home's base structure isn't completely destroyed, our SERVPRO professionals can fix the fire damage as well as any pesky odors that are sticking around after the flames are extinguished. 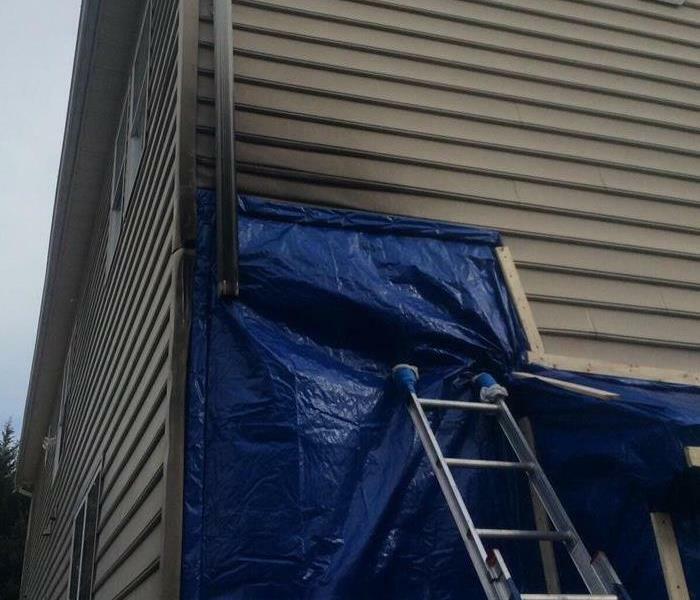 In cases as severe as pictured, the mitigation does take time, but we work efficiently, so the process is not painfully extensive, but we ensure the job is done right! In such delicate situations, it is so important to feel like you can trust the people putting your home back together, that's why our remediation and rebuild teams are so highly trained. Have no fear, SERVPRO is here! Applied structural drying is, as we always say, a special science, so DIY is never recommended. Luckily, we are certified via the IICRC to conduct this science in your home or business when water damage occurs. 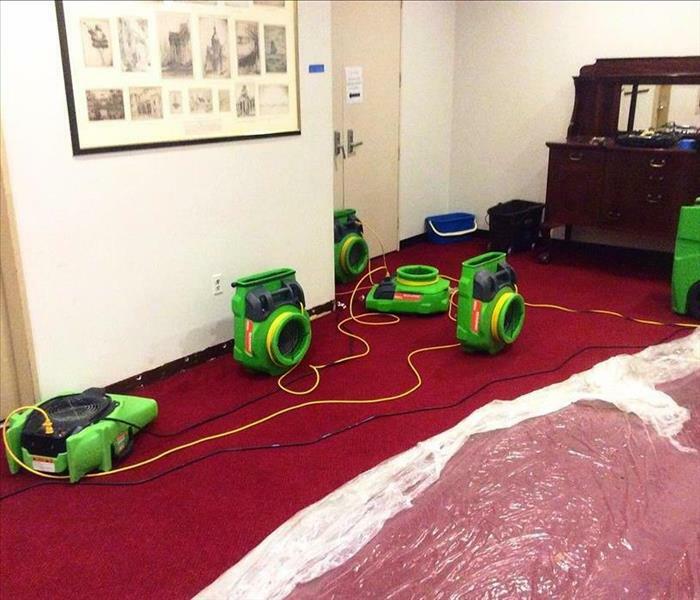 Here you can see that drying properly takes a plan and of course the right equipment to rid your property of water and prevent or abate any potential mold risk. That's why SERVPRO should always be your first call when you spot water damage. 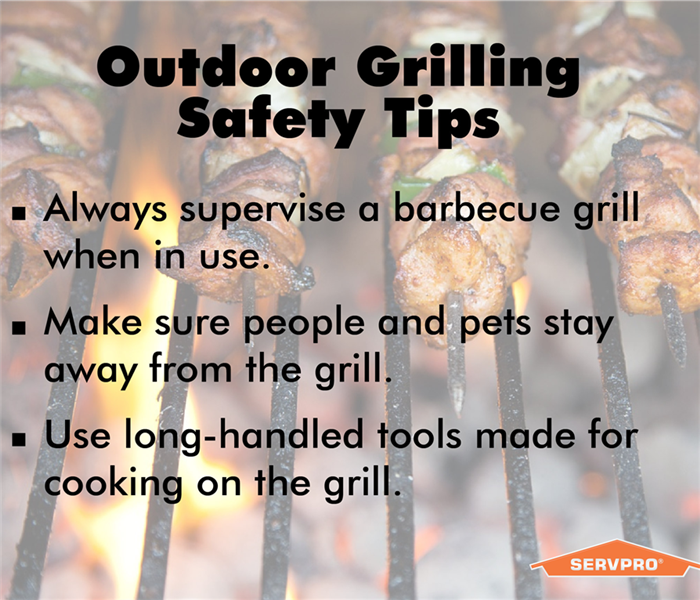 Check out these helpful safety tips for firing up your grill this summer. Grilling doesn't need to be a risky activity for you and your family, so play it safe and enjoy your food! The official start of summer is almost here, but it's important to remember that summer brings more storms with it. 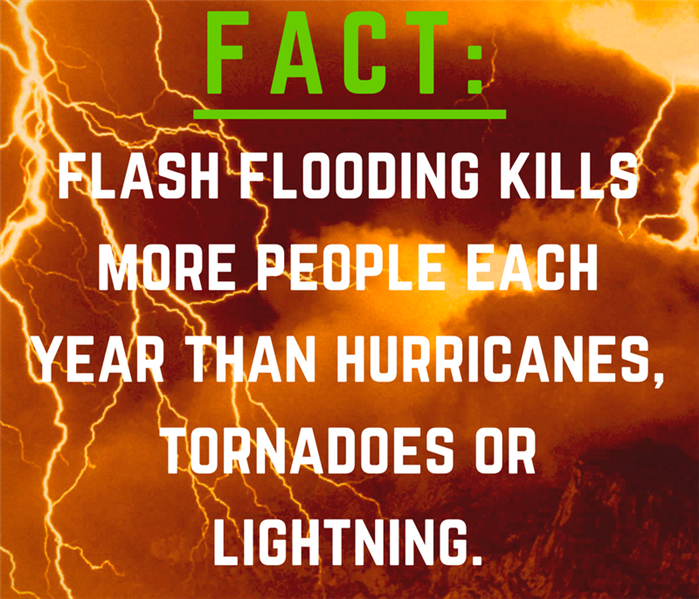 Flash floods are more common in the spring, but more storms in the summer means a higher possibility for flash flooding. Our crews responded to a sizable fire loss in the heart of Baltimore. You can see the flames burnt through quite a few layers of the wall and even singed the brick. The first part of mitigating a fire loss is precisely assessing the damage. Fire losses often call for tearing down before we rebuild. It's important to rid your home or business of any irreparably burnt items, especially for deodorization purposes. We always take account of our equipment before distributing it out on multi-story losses. This helps us devise the best plan to get the job done efficiently. There's nothing worse than losing time and money due to a long mitigation process. That's why SERVPRO of Baltimore's Inner Harbor knows how to work fast. Our crews responded to +3 stories of water damage to a large commercial facility in Towson after a mop bucket feeding faucet was left on all night. This loss was approx. 2 miles from the other major loss we had been working on at the same time, so we have been swapping special drying equipment between the two to make sure both facilities can return to normal operations ASAP. All Smiles No Matter The Hour! Dan L. and Chris Q. were all smiles during this major mitigation at Towson's Ruxton Towers...even at 4am! Nothing is worse than a team with a poor attitude during such a major inconvenience in your home or business. That's why we bring a great attitude with our great skills! Sprinkler Failures Can Flood All 10 of Your Floors! 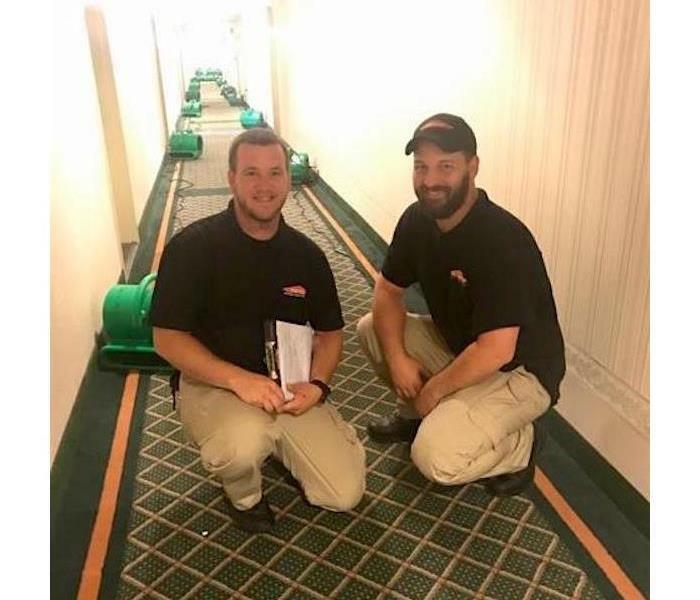 Our SERVPRO of Baltimore's Inner Harbor teams were called to Ruxton Towers of Towson to respond to a major water damage. The building house apartments, doctor's offices, and businesses. The water caused damage to 9 of 10 floors as well as the basement and parking garage. We arrived on scene at 4am and worked continuously to mitigate and restore normal life routine for residents and businesses alike. SERVPRO of Howard County also helped us out with this major loss. Nothing beats our SERVPRO family! Fire, much like your growing business, can start as small as ever and quickly become larger than you could have imagined. Fire damage is inconvenient no matter what, but especially to businesses. When it comes to the literal roof over your business' head, SERVPRO knows how to work fast and ensure you can return to normal business operations ASAP. We've seen a pretty wide range of fire damage, so no matter the size, we can get the job done. 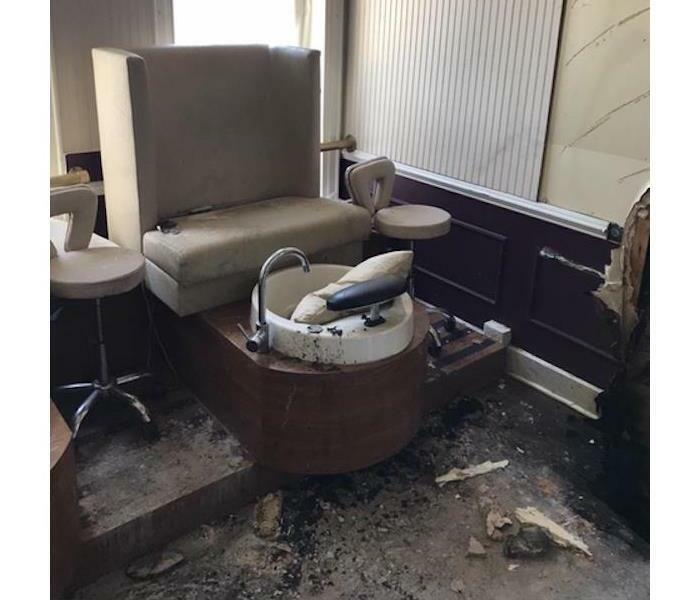 Any damage to your commercial property or business can a nightmare, but fire damage can be especially annoying. Our SERVPRO professionals are mindful mitigators who know how awful it is to lose time and money. That's why they are sure to work fast, and see to it that business can go on whenever it's possible. Summer time...the warm weather...the fun activities...and oh, yeah, flooded basements. 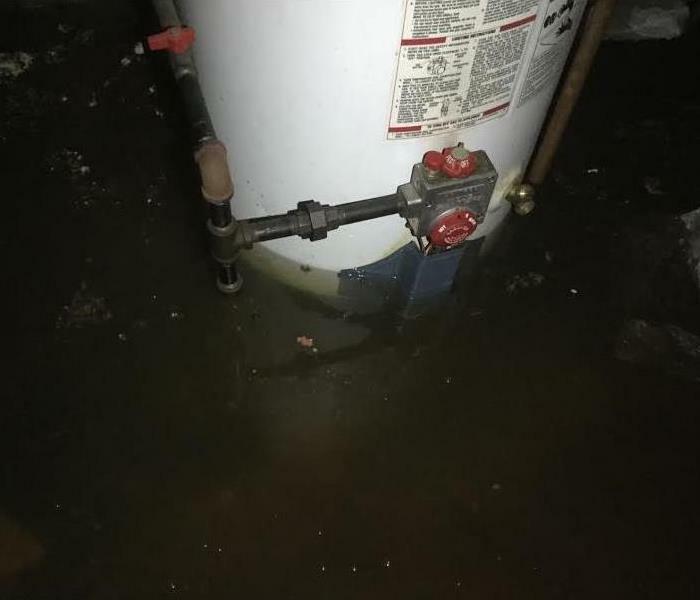 Summer storms can cause your power to go out, which can cause your sub pump to fail...which brings you the joy of having to deal with a flooded basement. We aren't afraid to do the dirty work and make sure the damage doesn't hurt any other systems in your home (much like this risk pictured here). Let Customers Flood Your Halls, Not Water! 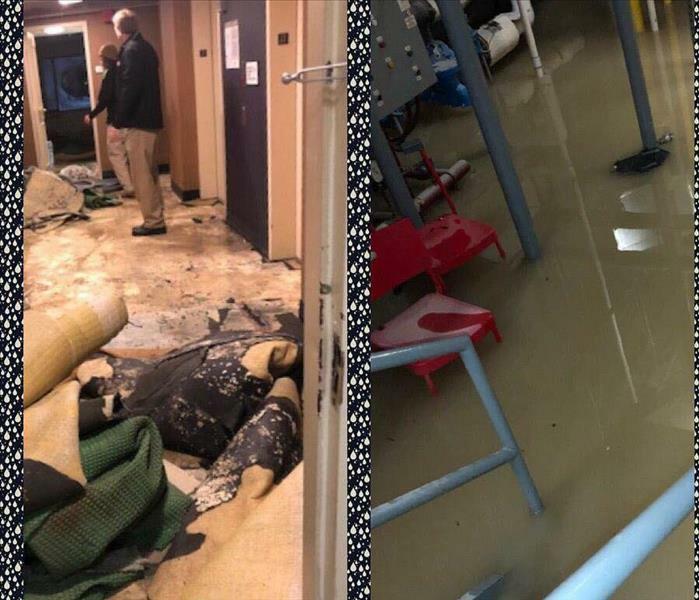 A bathroom water leak and flood at a local clubhouse left seemingly everywhere wet! We arrived on scene with our special drying equipment to dry out any damage and prevent any mold from growing in place of the water. Your shower can often times be a common breeding ground for all kinds of mold and bacteria. The best place to get clean can harbor the worst kinds of germs. Eek! Storm damage seems to have a way of making some unwanted additions to your home. For instance, a storm punctured a hole in a bathroom ceiling. This sizable crater looks like a makeshift skylight, if you ask us. These inconvenient losses to your home can cause a lot of frustration, which is why we make the restoration process so simple! Kind words from a satisfied customer! It was a pleasure helping Roland restore after a loss. We're here to help no matter how big or small the damage/loss might be! 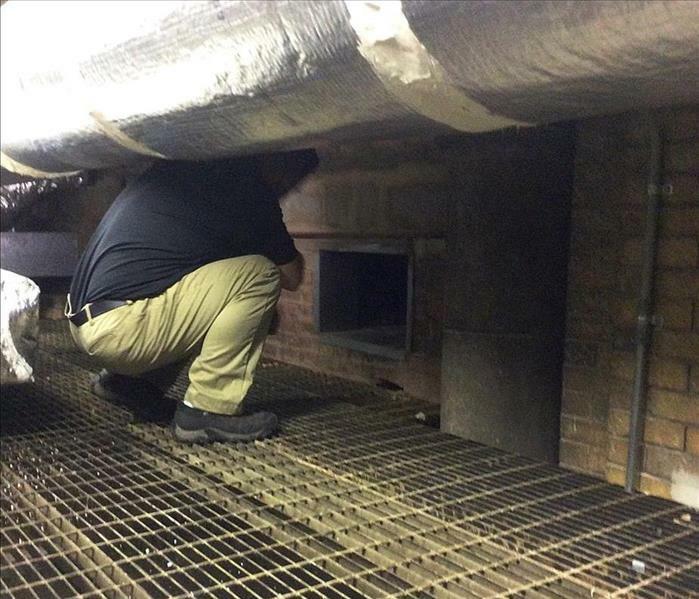 One of our technicians on scene inspecting a possible source of the water damage in The Lyric Opera House. In order to completely mitigate a water situation, our team must first find and stop the source of water. Some SERVPRO equipment on scene drying the halls of The Lyric after a water damage incident. Our team is trained in special drying procedures. These skills are crucial to keep mold from growing after a water damage incident. 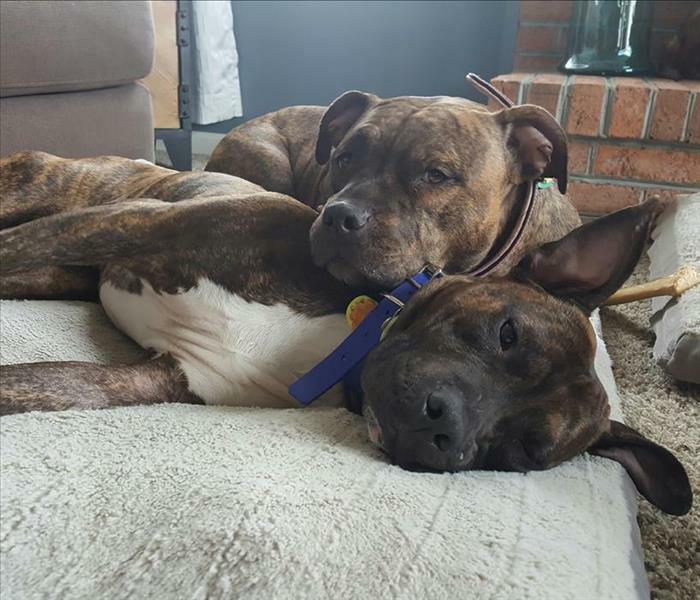 A heartbreakingly adorable photo of the two pitbulls our owner Annmarie rescued thanks to BARCS (Baltimore Animal Rescue and Care Shelter). The SERVPRO family loves to support the Baltimore community, no matter if it's the human community or the animal community! Storms over the city? Let SERVPRO be your first call! 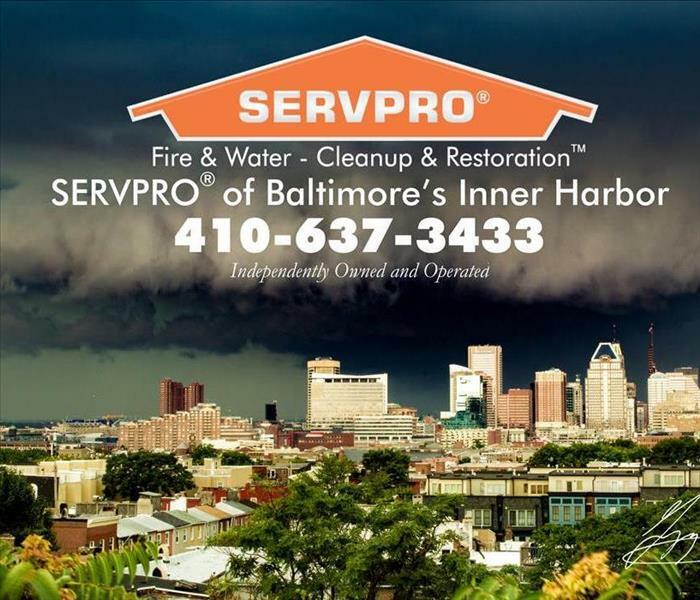 When storm damage wreaks havoc over Baltimore and Baltimore's Inner Harbor, let SERVPRO be your first call. Whether it be a sub pump flood, trees on your roof, AC condensation leaks, mold in your climate control building, we are here to help! We would like to thank Gregory McKay for this awesome snapshot of our beloved city.